Thanks go to everyone who read, wrote or helped out in any way in helping us to celebrate North East theatre. The review which created the most traffic was Jack And The Beanstalk at Newcastle’s Times Square Pantodrome http://www.northeasttheatreguide.co.uk/2017/12/review-jack-and-beanstalk-at-newcastle.html. Now we don’t claim to see every show but here are the shows that stood out for us from those we covered. We don’t pretend that this is anything other than a list of what we liked. We don’t go on anything technical or clever – we are just members of the audience that say if we liked the show or not, nothing more or less. You may disagree – great! We will be happy that the theatre that you saw caused you to react in that way. Please remember that we are Newcastle based and that will put a limit on how far we can reach out. Sad but true. However, we welcome reviews to be submitted and that has helped us to cover more shows in a bigger area this year. The theatre scene continues to thrive in the North East and this is flagged up most with shows about local people. We had a longer list than in past years to work on of great work that will, in past years, have taken this gong however Jamie Brown’s stunning race scene in Hadaway Harry was amazing. New production company Blowin A Hooley’s revival of Tom Hadaway’s Filleting Machine was very moving and we look forward to seeing what they come up with next. The football double bill at the Customs House featured a Q&A with the man in question of Jeff Brown’s Cornered himself. We know Lauren Pattison is set for bigger things and so the opportunity to catch her at the intimate surroundings of the Alphabetti Theatre was a treat. By way of example, we remember when Omid Djalili was the new lad appearing in a short set at a comedy club in Newcastle, long before he appeared on tv, and now he fills theatres. The NETG covers spoken word and comedy shows in different random venues and this summer we followed Viz co-creator Simon Donald around the region in a double decker bus. The trip is well worth doing if you get the chance. Every now and again you witness a show in which the set comes a character in itself. Not just simply a vehicle to ensure the action runs smoothly, it produces wow moments in its own right. This year’s award goes to quite a small touring show that was on a criminally short run at Northern Stage. 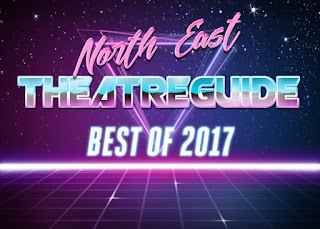 It has to be said that the Northern Stage had a fabulous 2017 with many brilliant shows in its various spaces and they had put together 2 of its strongest seasons in recent years. The news that Dance City is extending its work to include a base in Sunderland is welcomed as the popularity in these shows continues to grow. We have noted that in recent times many shows are now well deserved sell-out events. The standard of these shows continues to improve and this has been a really hard one to agree on so we’ve gone for a joint 3rd place. A lot of great musicals have gone through the region this year. There has been something for everyone and that doesn’t make our choice any easier. We thought we knew who would walk off with this award for most of the year and then the local lad popped up in December and blew us away. As for third place – you do realise we spend our Sunday evenings listening to Forgotten 80s on the radio? Typical. Just as our son grows up we start getting high quality children’s shows throughout the year. We have a sublime Christmas show, a high quality production created by young people themselves and an adaptation of a David Walliam’s best seller. This was another heading in which we started with a very long list of potential winners but it has to go to the show which put tears in our eyes as it shook us to our cores. Both Live Theatre and Northern Stage continue to host new writing and, along with Alphabetti Theatre, they give a high quality experience for those willing to take a gamble. It is a hattrick for Ray Spencer and the Customs House. Why? For the same reason it is the one panto that everyone in the North East who loves panto makes sure it is in their diary. Great script, great cast and design which puts a lot of other pantos to shame. Be beware of more expensive competitors! Snow White is the best Tyne Theatre panto we can remember seeing, as Charlie Richmond is finally given the reigns and fully exploits his potential as the comic. As for Jack, it hasn’t been out of the headlines but the cast put their heart and soul into delivering a very funny show. Stephen Sullivan was a proper bad guy and the lads in the bed scene is still making us laugh. These three Christmas shows were not just for the children. From the bonkers characters and amazing design in Alice, to the crazy stunts of Peter Pan through to hearing the screams during the 3D scenes in Jack, these shows had a lot to offer the whole audience. Another “radio play” picking up a gong. (Remember Frank Sumatra?) Blackadder was a real treat as we are fans of the original tv series. People’s followed up Richard III with another imaginative cracker. We loved the original film and wondered if it would transfer easily to the stage. East Is East was a very good adaptation. So much to choose from but Rattle Snake was superb and takes another award. Northern Stage was host to a number of excellent touring companies from around the globe and The Suitcase was no exception to the high standard’s in this season’s programme. We didn’t make it to Edinburgh this year and ended up watching 39 Steps in German in Berlin – but that’s another story. The Newcastle Fringe scene continues to be supported by a number of theatres but special mention must go to Ali Pritchard and his team at Alphabetti. If you’re wondering why they didn’t feature as strongly this year then you probably don’t realise that they were forced to close the venue next to the Central Library as it was to be demolished. Unperturbed they have set up yet another venue – this time sandwiched between the Discovery Museum and the Grainger Cark Park. If you haven’t spotted the venue on St James Boulevard then please donate some external lights so they can light up the sign at night! Out of the rubble great theatre and events have started again in Newcastle’s most eclectic venue. Their opening show was a superb return. Welcome back and we plan to be paying many more visits in 2018. So that leaves, once again, a thank you to everyone that has helped us by reading, reviewing, performing, inviting and booking the shows. Special mention goes to the very patient Joanne and our son Robert. He is only 14 and has literally sat through nearly a hundred shows. For the record Robert’s top pick this year was The Play That Goes Wrong and Jo puts Rattle Snake at the top of her list.